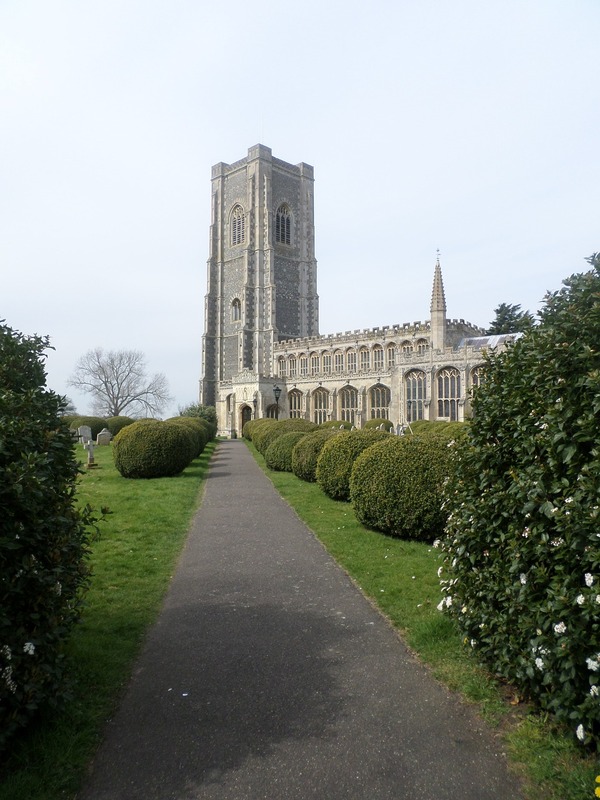 The history of Lavenham is one of gains and losses. In 1524 the village, a successful wool settlement, paid more in taxes than either Lincoln or York. Yet, 500 years later in 1824 the village was struggling with poverty. Today, it has recovered and is one of the best preserved medieval English villages. At the time of the Domesday Book, the village had a manor, a mill, woodland for 100 pigs, 2 dozen cattle and 200 sheep. The village grew with the profitable wool industry. It made and exported large quantities of broadcloth, Lavenham Blues. At its heyday, about 1530, it was the 14th wealthiest town in England. In the good years the wealthy cloth merchants, clothiers, invested in lavish timbered buildings. From then on it was all down hill. There was competition from skilled crafts people abroad and at home. Colchester made finer and cheaper cloth. Later the industrial revolution moved the woolen industry to Yorkshire. As the wealth declined, there was little money to spend on Georgianisation or Victorianisation. The village was unfashionably medieval, the timbered buildings remained lived in but unchanged. The railway arrived in 1864 and industry followed the railway. Sugar beet, horsehair weaving and coconut matting industry provided some work, but factory workers were poor. After WW2 the town’s fortunes changed. The state of the medieval buildings was a concern. But, rather than replace them, people realised their value as heritage assets and preserved them. In the 1950s the most important buildings were listed. And, in 1973 the town became a conservation area. Henry III licensed the market in 1257. The Market Cross, bought from the legacy of a wealthy clothier, William Jacob, in 1502 still remains. A scheduled monument, its base is original but the date carved on the shaft is 1725. The Guild of Corpus Christi built pride of the village, the two story, timbered Guildhall in Lady Street around 1530. Today, the National Trust manages the Grade I listed building. 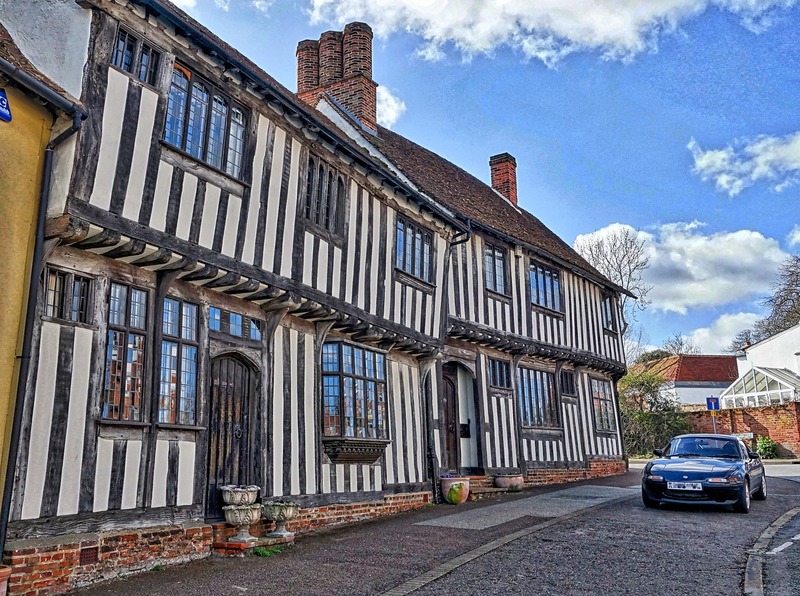 The Guild of our Lady built the Wool Hall in 1464, topped by a great timbered roof. The building, Grade I listed, now forms part of the Swan Hotel. After the dissolution, the Wool Hall became a cloth and yarn market. Princess Louise, daughter of Queen Victoria bought it. She had it moved, but returned the timbers to the town and they now form part of the Swan. The C17th Shilling Old Grange is in Shilling Street. In 1706 Isaac Taylor rented it for himself and his daughters. One of them, Jane, wrote a poem entitled The Star, which became the lyrics for Twinckle Twinckle Little Star. Little Hall is the C14th clothiers hall. In the C20th the Gayer-Anderson brothers bought it to hold their collections of books and artefacts. The Suffolk Preservation Trust restored the building and it is now a museum and gallery. 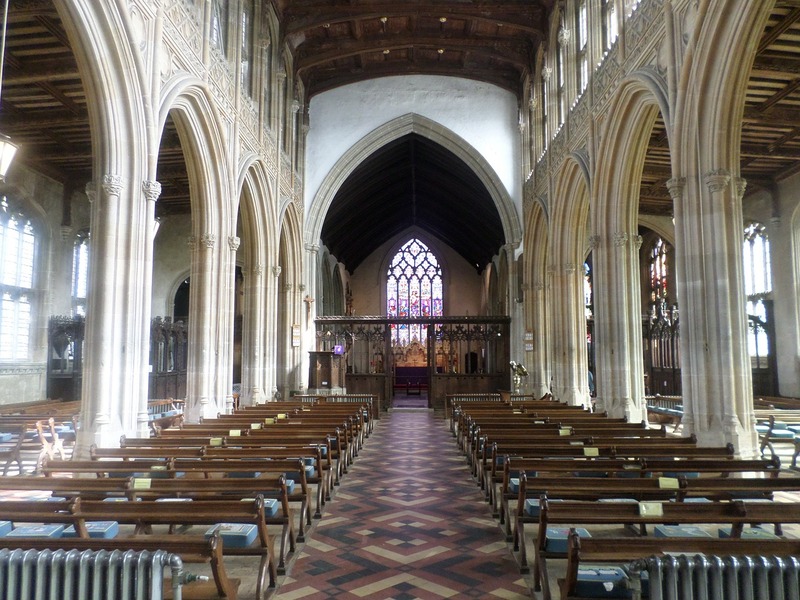 The nobleman, John de Vere and his wealthy supporter Thomas Spring, built the Church of St Peter and St Paul. It is a splendid example of late Perpendicular Gothic. In St Catherine’s Chapel there is renaissance woodcarving and fan vaulting. In the C20th, the film and TV industries showed the village in several films including the Witchfinder General (1968). More recently scenes from both Harry Potter and Deathly Hallows feature De Vere House on Water Street. But, in the 1990s, the TV series Lovejoy put Suffolk’s wool villages on TV screens around the world. Previous PostBrighton, the play ground of the Prince Regent, later George IV, has entertained sea-side visitors in style for more than 200 years.